George McPhee approached the stage and paused to survey the packed ballroom in a downtown Washington, D.C., hotel. 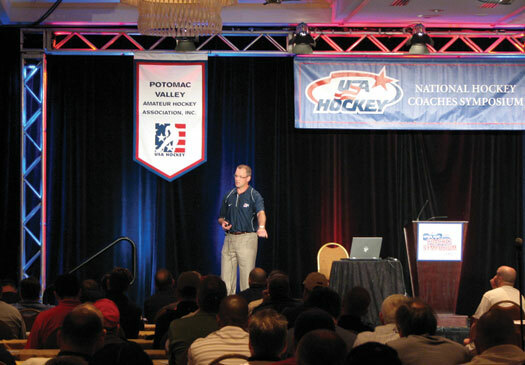 "This is a pretty impressive group of more than 500 coaches here this week to learn and improve and make things better," said the general manager of the Washington Capitals, who was one of the keynote speakers during the opening session of the 2012 National Hockey Coaches Symposium. "Wouldn't it be nice if the 500 people on Capitol Hill came here to learn and improve and try to make things better." What would a Beltway hockey brainstorming session be without a little political humor to break the ice? McPhee, who is entering his 15th season as the architect of the high-flying Capitals, is also a hockey dad who issued high praise to the grassroots coaches who make the game go. "Don't ever underestimate the influence you have," said McPhee, who played college hockey at Bowling Green State University and won the Hobey Baker Award in 1982. "I've been around the NHL for 30 years. My son [Graham] doesn't want to listen to me, but he will listen to Coach Mike and Coach Rob." It was a theme echoed over the four days by some of the most experienced coaches and administrators in the game, including Brian Burke, general manager of the 2010 U.S. Olympic Team and general manager and president of the Toronto Maple Leafs. 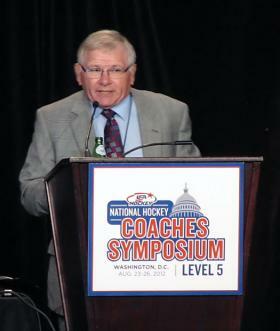 "The lynchpin of the hockey system is the volunteer coach," said Burke, who was making his third appearance at a USA Hockey coaching symposium. "We are all in your debt, and we appreciate everything that you do. That's why I'm always willing to be here if it's humanly possible." The National Hockey Coaches Symposium is held every two years for coaches looking to attain their Level 5 coaching card, the highest level of USA Hockey certification. This marked the first time since the program's inception in 1985 that the symposium has been held in a Southern hockey market, something that organizers were proud to point out. "We worked hard for two years to bring this event here," said Ty Newberry, the Southeastern District coach in chief who spearheaded the effort to bring the even to the Nation's Capital. "We believe that the growth of hockey in the District warrants it. We've been fortunate to have players drafted from the area. A lot of that is attributed to coaches." One of the offshoots of hosting a symposium of this scale was the opportunity that it afforded to local coaches to gain knowledge and experience that they can in turn pass on to others in their association and Affiliates. "We have 106 coaches from Maryland, Virginia and Washington, D.C., who registered for this symposium," said John Coleman, president of the Potomac Valley Amateur Hockey Association. "This is a great experience for them to learn from professional coaches and go back to their programs and talk about what is happening. There's a real ripple effect through the Affiliate and the District. That's what we want." In addition to general sessions, coaches learned innovative approaches to coaching through intensive breakout sessions dedicated to the specific age level of the players they're coaching. "For me it's like taking a sip of water out of a fire hose," said Micah Stipech, a high school hockey coach from Houghton, Mich. "It's been fantastic to be a part of this. Not only were there so many great speakers who have put out a lot of great information, but it's an opportunity to network with other coaches and find out how they do things." Even those who played and coached at the highest level found the symposium to be worth their while as they listened to NHL coaches such as Dan Bylsma, Kevin Dineen and Joe Sacco, as well as former NTDP coaches Ron Rolston and John Hynes, who now coach in the American Hockey League. "Whether you're an elite coach or have played in the NHL or even if you have never played a day, being here is about sharing ideas," said Matt Herr, a former NHL player who recently coached the U.S. Under-18 Select Team at the Ivan Hlinka Memorial Tournament in Piestany, Slovakia. "There aren't many times when people are willing to share what they know. They're all worried about winning, and this is my secret and that is your secret. Here you have NHL coaches standing up there giving away their secrets. "I think it makes a good statement about USA Hockey that we're all in it together and we're all here to help each other and progress to become a better coach." The first year of Level 5 certification was 1985 as the brainchild of Ken Johannson, the creator of USA Hockey's Coaching Education Program, and typically features a number of professional, college and international coaches discussing various aspects of coaching. Over the years the symposium has grown into a celebration of grassroots coaches in addition to those who have achieved the highest levels of the game. "Some people may walk away from here with 100 things and others may take away one," Herr said. "But I guarantee you that everyone here walks away with something."